HissTank › HissTank Community › Wordburglar Tours Cleveland and Cincinnati Ohio with the Cybertronic Spree on April 5th & 6th! Wordburglar Tours Cleveland and Cincinnati Ohio with the Cybertronic Spree on April 5th & 6th! 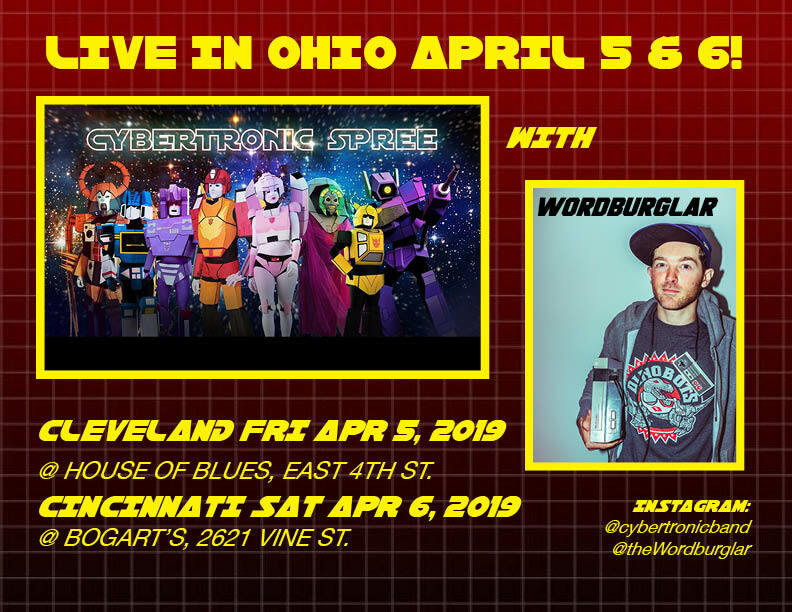 For all the Tankers in Ohio, Wordburglar is coming through Cleveland and Cincinnati with the Cybertronic Spree on April 5 & 6, details are below! Hey guys, some of you know that other than being a huge Joe fan, I make rap records. My latest project is called �Welcome to Cobra Island� and combines my two loves in a way I hope you�ll enjoy as much as I enjoyed making it. The first single is called �A Letter from Snake Eyes� (parts 1 & 2) and includes the track �Rap-Viper� which is about a rapper who grew up on Cobra Island (obviously ;) ). Anyway, you can download the Triple-Single for free right now and I�ll be releasing the full length album in May. Yo Joe! This ... is awesome! So many fun references, but nothing's forced. Nicely done! Best of luck! "I once got busy in the back of a Buzz Boar..."
You've got some pretty clever puns/rhymes in there, man. Your flow has a bit of a Dr. Octagon/Kool Keith vibe. I threw a few bucks your way. Good luck and keep us updated! How much longer until the rest is available? Edit: I can't wait until May. Thanks for checking it out everybody, really appreciate the support. This whole album has been really fun to work on and I can't wait to share the full thing (all free). I clicked the link somewhat against my better judgement..
And damn, man, you've got the chops. It works as a fun bit of Joe fandom, and it works as clever rap with engaging wordplay and a confident voice.